Previously on Orange Is The New Back, Achilles Goss took a pause in Brittany. 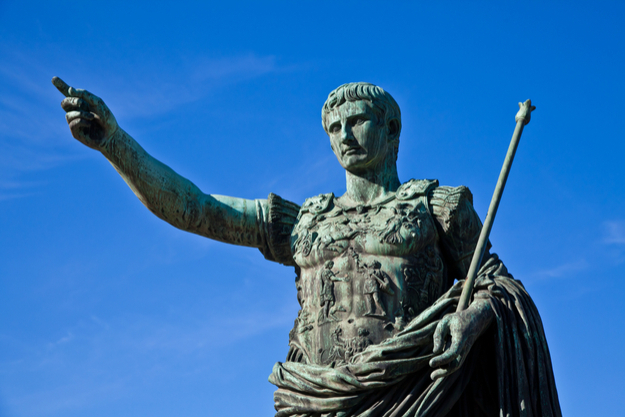 'Iacta alea est' is a Latin phrase meaning that 'the die is cast', supposedly uttered by Julius Caesar as he crossed the Rubicon River with his army…beginning the chain of events that led to the formation of Imperial Rome. The point of no return had been reached and going back was not an option for Caesar and his men. Navigating the Promotion Play Offs was Achilles Goss' Rubicon. A 4th place league finish meant FC Lorient had it all to do: two games against Ligue 2 rivals Sochaux (home) and Lens (away), before facing off against higher opposition in Dijon home and away. Iacta alesa est for Achilles was positive football, playing out from the back and being patient no matter what the odds - this was how FC Lorient were going to do this, it was too late for wholesale changes. A 2018/19 Play Off finish. The winner meets 18th place in Ligue 1, home and away (the first leg being at home for whichever Ligue 2 side makes it through step 2). It’s a real examination for the Ligue 2 sides in 4th and 5th, especially when you face the higher opposition club over two legs. Personally, I quite like it. It’s an effective filter for ensuring that clubs are competitive enough to go up. But it’s a real ball ache when it’s actually your side going through it! Going into the Play Off period, I used ‘Big Match Preparation’ for the first time in FM19 as a training programme. It looks to boost happiness a little bit and obviously work on penalties which may become a decider if I was to draw over 120 minutes. Towards the end of the season, Spaniard José Manuel Aira had got Sochaux playing some really nice football. When they arrived at Lorient 3 weeks prior to the season finishing, we played out a tight 0-0 draw. Sochaux were clearly going to be difficult to break down. On 25 minutes however, we found a breakthrough…Franklin Wadja going long for Fonsinho with a great ball. The Ivorian’s first touch and close control saw him close in on goal, before finishing well. It was no less than we deserved and seeing a 14 pass move that stretched across the pitch was pleasing to see. Goss-ball? Well, it’s too early to say…but I am loving the way we’ve controlled games in recent weeks. If Sochaux were going to threaten me, I always suspected that it would involve my Right Back: Jonathan Martins Pereira. Pereira was having a really bad game and he failed to pick up Mohamed Larbi on the back post for an easy header. It was 1-1 on 75 minutes. The game fizzled out into a drab affair, the only dramatic turn of events was seeing Jonathan Martins Pereira sent off for a second yellow card offence in Extra Time. Suddenly Lorient were desperate for penalties, and that’s exactly what we got! The ‘Old Guard’ of Yann Jouffre and Sylvain Marveaux were now on, and I felt happier to have their maturity going into the penalties as 1st and 2nd choice takers. Complementing them were Wissa, Courtet and Le Goff who are also relatively composed. We’d end up winning 4-3, Yann Jouffre to miss our opening kick but the turnaround was made with the next 4 penalties being lethal. We were through to face RC Lens away! FM Grasshopper adjectives: laboured, uncomfortable and uneasy. It was 2-0 Lens after just 8 minutes, two shots from Arthur Gomis was all it took. Even after a few days break from this game, it still feels surreal writing that. Achilles Goss and Lorient were staring at another Ligue 2 season after just 8 minutes! But this game made no sense whatsoever. For the quit/reloaders, you may want to read on…because miracles do happen in this game. Sometimes it’s worth playing through the shame (and high levels of humiliation I was receiving in my Slack channel). RC Lens 3-0 FC Lorient facepalm. Courtet’s 2nd on the night, and our 3rd, was a cracker. It came via the final attack of the game on 90+5 minutes; Grasshopper HQ erupted into fanfare. The game had been brought back from the dead. Note - I must also thank the Public Beta for that sweet assist too, a great cross from rookie Right Back Houboulang Mendes #WeDrawAgain. So, we headed for penalties. Again. Our second 120-minute game and shootout in 3 days, the Lorient warriors were knackered (and so was I). But I strangely felt confident: (1) I never expected to be here at minute 65 of this game, (2) we had yet again practised penalties and (3) I went with the same five guys. Jouffre, Marveaux, Wissa, Courtet & Le Goff had another chance to make themselves heroes. It was Wissa’s turn to miss, but it did not stop Goss’ men: 4-3 on penalties and FC Lorient were through to face Dijon FCO in the Ligue 1 Play Off. Phew. The winning penalty kick taken by Vincent Le Goff. FM Grasshopper adjectives: euphoric, gripping and sickening. Fortunately, we had a 12-day break between fixtures, so I went with a defensive training style for the full week of training without fixtures. I figured we may need to up our defensive game against higher opposition and not conceding an away goal was crucial. After the season I had, and the previous game in particular, I did not know what to expect when facing Dijon. 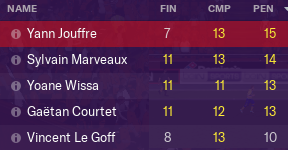 We had bested a Ligue 1 team previously in the French Cup, beating Guingamp 1-0 at home, so there was a belief that we could take a lead back to Dijon for the 2nd leg. A minor headache presented itself though when Goalkepper Danijel Petković failed to make it back from International duty with Montenegro. A third career start was given to teenage goalkeeper Illan Meslier, which left me seriously worrying if the clean sheet was going to be a dream. 3 in 3 for Fonsinho! Courtet finishing Cabot’s silky pass. FM Grasshopper adjectives: dominant, pleasing and sanguine. So, if you’ve read this far you would know by now that ‘our way, is the hard way’. Nothing we ever do is easy, as our 2nd leg proved. For Dijon, it was time to introduce their big guns: Hamit Altintop & Yoann Gourcuff who came into the side. Achilles Goss re-introduced Petković in goal, but otherwise left FC Lorient unchanged. The game was my first introduction to VAR, which appeared twice at two key points. On minute 82 it was a heart in the mouth moment. 18-year-old Falaye Soumaré scoring to ruin the dreams of Achilles Goss…but NO! VAR had come to save us this time round, the Dijon teenager stepping offside in the build-up. Cue another few minutes of tension, as we did our best to avoid Extra Time and penalties once more. The whistle at Full Time brought great jubilation at Grasshopper HQ: FC Lorient were promoted to Ligue 1. This post was originally set out to bring you an introduction into Season 2, as I move forward through pre-season…but I on greater reflection I wanted to fully capture these Play Off matches. Our style of play brought drama and excitement for the Lorient fans, and I am not going to shy away from this approach now that we’re in Ligue 1. There’s going to be hard moments for sure, but I’ve got to strengthen the squad where I can and continue the approach that has brought success. This is Achilles’ version of "Iacta alea est". Armed with a new contract and delivering on promotion within the 1st season, Goss' battle now shifts to Ligue 1 survival. For now, orange is still the new black. Thanks for reading/sharing & caring.